Texas experienced a record-breaking drought and major wildfires in 2011, creating increased awareness of limited water resources. According to the state climatologist, the current drought could be just the start of dry spell that could last until 2020. 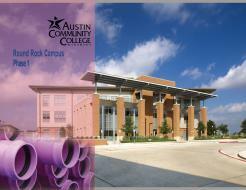 In 2011, ACC worked to make reclaimed water infrastructure available for the Riverside Campus. 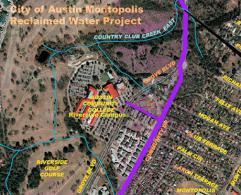 It was a collaborative effort between the City of Austin and ACC to prepare the future development of the college and save resources. In 2009, Purple Pipes (reclaimed water pipe) were installed at Round Rock Campus in collaboration with the City of Round Rock for future reclaimed water connection. In 2015, the City of Round Rock finalized the Reuse Water project nearby ACC Round Rock Campus, now the campus is irrigated with the City's Reuse Water. ACC has retrofitted water-saving plumbing fixtures throughout the district, including 0.35 gal/min faucet aerators, which cut down water usage by more than 80% from conventional faucets; Upper Cut Toilet Flush Handles which use 1/2 Gal of water per flush; Water-Saving Urinals which use 1/8 Gal per flush.